I'm returning to AS3/Starling/Feathers development after 2 years of absence. At the time I was using FlashDevelop and pretty happy with it. From a brief look I understand it's not being actively developed anymore, or at least as it was back then. Any suggestions on what IDEs are out there worth taking a look. Mostly working with big projects, lots of files etc. For AS3/Flex I'm using IntelliJ 14 (dated from about 2 years) and happy with it. Before that, I used Flash Builder (the worst IDE ever). I tested the next caming version 2018.1 and there is 0 inovation not only the plugin side but also as generic IDE but as version 14 -> it's a good IDE. It's already difficult to do more for a IDE. When working on Feathers, I use Visual Studio Code with the ActionScript & MXML extension. VSCode is somewhere between a basic text editor and a full IDE. With that in mind, it's not necessarily for everyone. I really like it, though. It feels lighter than Flash Builder and IntelliJ IDEA, but it still offers many of the same powerful features. To set up a project in VSCode, you'll need to edit some configuration files rather than navigate around dialogs with your mouse. However, you also get the fancy features of an IDE, like code completion, information about classes/variables on mouse hover, Ctrl+Click jump to definition, debugging in AIR and Flash Player, and more. Before I switched to Visual Studio Code, I used IntelliJ IDEA, which I still think is an excellent IDE. Full disclosure: I am also the author of the ActionScript & MXML extension. @Josh I've been trying out VS Code with your extension tonight to see if I could move over from FlashDevelop. On the whole, I like it and I think I could cope! Like you said, there's a lot more typing and a lot less clicking for configuration. I think it's much better for understanding what's going on behind the scenes, but I'm slightly worried about missing settings that I didn't know were important. The documentation is really great though, so I'll just have to read it all carefully! 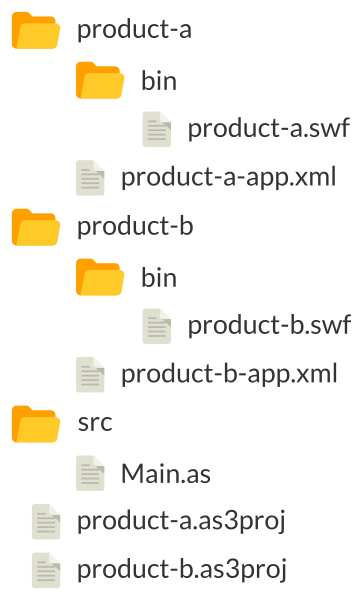 So the products run off the same source code, it's just the assets in the bin folder (not shown, but db, icons, images, etc.) that are different per product. I switch between the .as3proj files in FlashDevelop (just double-click them) when working on different products. Is there a way to replicate that structure with your extension? Or is there a structure that would work better with your extension? I'm also using IntelliJ 14 - very happy with it. Big improvement compared to FDT (after using it for many years). I plan to eventually add a task for installing your app on a device. I just haven't gotten around to it yet. In the meantime, you can create "custom tasks" in tasks.json that simply run an executable from somewhere on your computer. You could use this to run Adobe AIR's adt command line tool to install your app on the device. See Tasks In Visual Studio Code and ADT installApp command for details. This structure should work, but you won't be able to open all of your projects in the same window right now. The extension doesn't yet support what Visual Studio Code calls "Multi-Root Workspaces" where you can open multiple root folders in the same window. If you need to switch between different sub-projects, you need to open each of them in a separate window for now. So, in your case, you'd have a window for product-a and another window for product-b, and each folder should have its own asconfig.json. You can set ../src/Main.as as your main class in the files field in asconfig.json. Each project will probably need to add ../src to the source-path compiler option too. Any directories added to the source-path will appear in the ActionScript Source Paths view, or you can quickly access any class in the project using Ctrl+T and then typing the name of the class. I did give it a look and loved the general feel, not a problem with configuration files but unfortunately I hated the fact that you cannot make windows float and spread them around my monitors. Been used to working with multiple monitors for years is really hard to contain myself in one monitor and not being able to have them where/how I want. I guess I'll have to use something else for now. Thanks all for the very useful comments! @MarekBrun re: " Big improvement compared to FDT (after using it for many years)." I'm using FDT at the moment, but it's VERY expensive, thinking of switching to inteliiJ .. What are the biggest differences between those? And how did using InteliiJ improved your workfow / coding / app builds comfort etc? I use JetBrains product (PhpStorm) occasionally but not for AS3 / AIR. What I like the most about FDT is author time checking for compiling errors, that saves me TONS of time! Is it possible to run Unit Test with VScode? There is no built-in unit testing features in the ActionScript & MXML extension for VSCode. Personally, I always run my unit tests using the FlexUnit Ant task. Sometimes, I simply run my tests in the debugger like a regular project, and the output appears in the debug console because I've set up a TraceListener with FlexUnit. I'm still using Flashdevelop as well. Does what I need, though it does feel a bit "heavy" at times. I don't know why our community should have such a disadvantage? I don't know why the IDE of adobe Animate should be ridiculous? I don't know why the Flash Builder be the worst IDE and without Design environment? Really loving VSCode. I'm using it for everything now; Unity, Arduino, and I'll using it for Flutter I think. I've been a long time Flash Builder guy, but am now looking into VSCode. Thanks Josh for the extension! It looks pretty cool, but what do you guys do for debugging on the actual device? With Visual Studio Code, you can connect the debugger to your app running on the device. You'll need to install a debug build of your app manually over USB. After that, run the "attach" launch configuration in VSCode, and then start the app on your device. It should connect automatically over wifi, if you've set everything up correctly. Awesome, thanks for the quick response Josh! Thank you for all that you continue to do to keep ActionScript alive! I really hope that interest in it continues. ActionScript/AIR is such a great programming language/platform. I've been using IDEA for a while now, any advantage of VSC over it?. I've used IDEA as well and I don't know about advantages, but one thing I would say is that it's super light weight and it does have a community around it (mostly Josh right now) as where IDEA doesn't currently receive any updates. IntelliJ itself receives updates, but the Flash plugin hasn't received updates in a long time and most likely won't receive any in the future. The Feathers SDK and Apache Royale both require special workarounds in IntelliJ IDEA (and Flash Builder too). They are both fully supported as first-class SDKs in ActionScript & MXML for Visual Studio Code. ActionScript & MXML for Visual Studio Code is open source. If I were to ever abandon it, the community could create a fork and continue development.